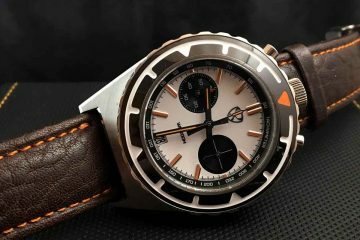 Up until now, I had reviewed SPOT watches from all the MSN Direct watch manufacturers (Swatch, Fossil, Abacus, and Suunto) except Tissot. And now that I have finally had a chance to put the Tissot High-T through its paces, I can honestly say that I have saved the best for last. There are things about all the SPOT watches out there that I like, but the Tissot High-T is by far the highest quality, most feature-rich, and best looking. At $725 retail (and very few discounts to be found), it’s also the most expensive, but this is definitely a case where you get what you pay for. 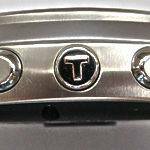 Stainless steel or titanium construction. 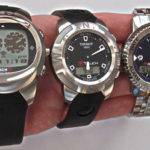 Plastic watches certainly have their place, but the perfect digital watch must be sturdy, and have at least a hint of class. Sapphire crystal. Synthetic sapphire is usually reserved for higher-end watches, which usually means automatic analog watches, while most digital watches have soft acrylic crystals. 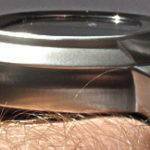 In the middle, you have your mineral crystal, but the perfect digital watch would need nothing less than the almost completely scratch proof sapphire. Renewable power supply (after all, who wants to worry about having to get a battery changed?). 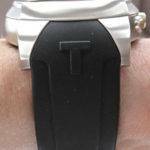 This usually comes in the form of a battery that is recharged either by plugging the watch in, or by solar energy. Automatic time calibration. 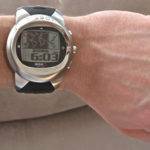 The perfect digital watch should keep perfect time. Vibrating alarm. 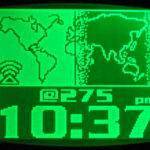 I’m really surprised this isn’t a bigger feature in digital watches. I’m ok with the fact that I like geeky digital watches, but there’s no need to advertise it to the world with constant beeps, chirps, and chimes. Just like I prefer a silent cell phone, I’d like a silent watch, as well. Water resistant. It doesn’t have to be suitable for scuba diving, but it should be able to withstand an unexpected downpour, and even a little recreational swimming. Countdown timer. I think countdown timers are probably the third most useful feature (behind time and date) on digital watches. How else will you know when your frozen pizza is ready to come out of the toaster oven, or when it’s time to feed the meter again? Stopwatch. It doesn’t have to record a million split times, but a few would be nice. Resolution should be 1/100th of a second. Backlight. 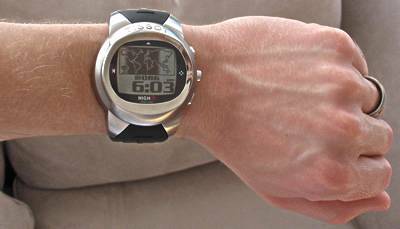 On a digital watch, that usually means an electroluminicent backlight, though if we’re talking about a digital watch which also has an analog display (like several of the Casio G-Shocks), an LED light is very nice, as well. Visually appealing. Of course, this is pretty subjective, but the perfect digital watch shouldn’t be one which I feel compelled to keep concealed beneath the sleeve of a heavy sweater or parka. So what does my vision of the perfect digital watch have to do with this review? 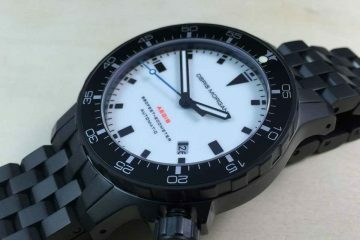 In all my hours of searching and testing, I have not been able to find a single watch that comes closer to to my vision than the Tissot High-T. That’s not to say it’s 100% perfect, but in terms of features, construction, and aesthetics, it is probably the most complete and compelling digital watch I know of. Touch crystal. The Tissot High-T is part of Tissot’s Tactile line of watches which means you can tap on different parts of the crystal rather than pressing buttons to operate various functions. 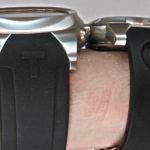 I have two other Tissot Tactile watches (the T-Touch, and the new Navigator 3000), and I really like this feature. 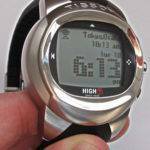 The High-T is the only MSD Direct watch with a touch crystal, which I believe makes is slightly easier and more comfortable to use. Vibrating alarm. SPOT watches have a tenancy to be noisy. I find I’m constantly receiving news alerts, instant messages, and appointment reminders. And then, of course, you have your hourly time signal, alarms, and countdown timer. 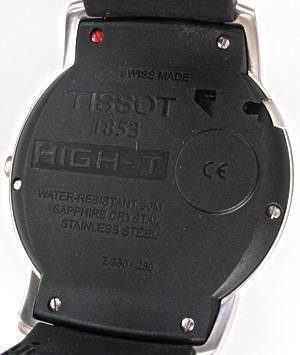 The Tissot High-T is the only SPOT watch with a discrete vibrating alarm. In my opinion, this feature alone makes it the most compelling choice. Sapphire crystal. I’ve put enough scratches on crystals that I have really come to appreciate synthetic sapphire, and the Tissot High-T is one of the few digital watches outfitted with one. Sapphire is a must, in my opinion, for watches with touch crystals so you never have to worry about wiping off smudges on whatever material happens to be nearby. As long as you don’t use a diamond, ruby, or another sapphire to try to polish your High-T, the crystal is not going to scratch. Very bright backlight. The Tissot High-T and the Swatch Paparazzi have the brightest, nicest backlights of any of the MSD Direct watches. Not only can the watch be easily read in the dark, but it can be easily read in the dark from across the room. Shortcut screen. The Tissot is a very feature-rich watch which means navigating to the specific screen or channel you want could take some time. That’s where the shortcut screen comes in. Touch the right side of the crystal for about two seconds, and the shortcut screen appears, allowing you to jump instantly to any one of four of your most frequented channels. Brilliant. Programmable alarms. 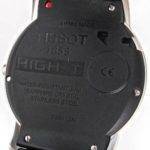 The Tissot High-T has two programmable alarms, which means you can specify a date in addition to the time. You can also choose an audible alert, vibrating alert, or both. Countdown timer. 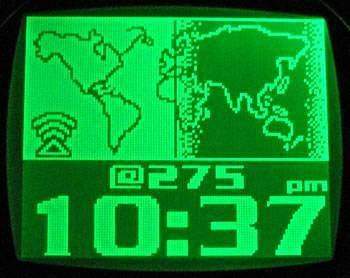 No digital watch is truly complete without a countdown timer. The Tissot High-T adds a nice touch to an otherwise standard timer by gradually filling up the screen line by line from the bottom as time counts down which allows you to get a quick visual indication of how much time is remaining. Very unique and useful. Stopwatch. The chronograph on the Tissot High-T is nice and large and easy to read and operate. It supports up to 99 splits and will go up to 23 hours, 59 minutes and 59 seconds before flipping. The resolution is 1/100th of a second. Stainless steel case and buttons. The High-T’s case is heavy, thick, and sturdy. The buttons feel firm and satisfying, and provide excellent feedback. 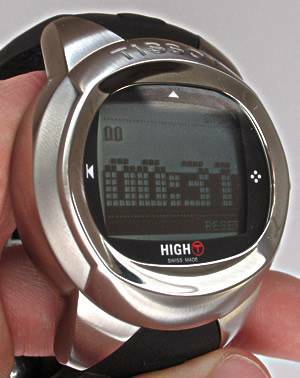 SPOT watches generally require a lot of button pushing (not as much with the touch crystal, but still a fair amount), so you want a set of buttons like those on the High-T that provide a good user experience. The Swatch Paparazzi, Tissot High-T, and the Suunto line of SPOT watches all have excellent buttons. Large, readable LCD. 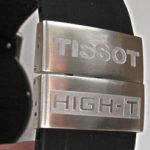 The LCD on the Tissot High-T is one of the best I’ve seen. It is large and readable with plenty of contrast. The only SPOT watch that can compete in terms of screen size and contrast is the Swatch Paparazzi which makes perfect sense since they probably have the same components inside (Swatch Group owns both Swatch and Tissot). Rechargeable battery. The battery on the High-T is impressive. I found I only needed to plug it in for a couple of hours about every five days or so. If you’re not actively using the alarms and the backlight, it will go even longer than that. It comes with a very compact and convenient USB recharger for people like me who are seldom away from their computers, and a wall charger, as well. Water resistant. 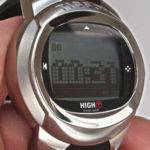 Although the touch crystal won’t work under water, the High-T is water resistant to 30 meters, or about 100 feet. 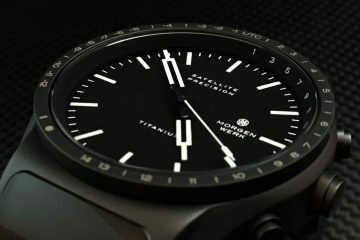 Almost everything, but especially the two things that really set this watch apart from just about any other digital watch out there: the vibrating alarm function, and the sapphire touch crystal. Even without those two features, I think the Tissot High-T is the nicest SPOT watch, but throw in a silent alarm and an extremely innovative and practical navigation system, and you definitely have one of the coolest digital watches in the world. 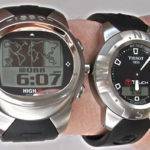 I could say price, but I won’t because watches (like almost everything else in the world) are worth what people will pay, and if you want the top of the line MSN Direct watch, and one of the most versatile digital watches around, you will probably pay. And in the overall scheme of things, $725 is not a terrible price for a watch, especially when it is in the top of its class. I wouldn’t mind seeing the High-T a little less hefty, though. Tissot definitely needed a pretty substantial case to cram all those features into. Personally, I stopped worrying about watch size a long time ago, but if you have dainty wrists and a delicate ego, the size of the High-T is something to consider. 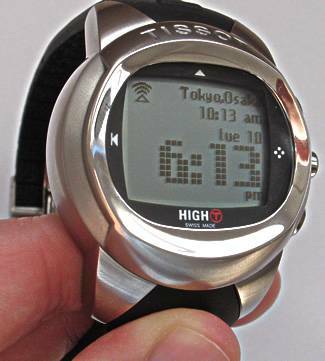 The last thing I don’t like about the High-T is the fact that you actually have to cut the rubber strap down to size. When I retire a watch, I really like to be able to pass it along to friend who has been drooling over it incessantly, or at least have the option of selling it if nobody I know wants it, but once you cut the High-T down to your size, it may very well be yours for life. Not such a big deal for a $200 watch, but it would be nice to give a $725 watch a second life. 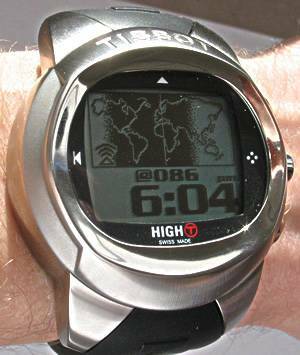 If you’re in the market for an MSN Direct SPOT watch, and you absolutely have to have the best, look no further than the Tissot High-T. 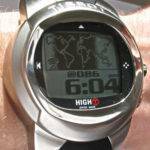 The other MSN Direct watches are fine, and each one certainly has its place, but the High-T’s place is clearly at the top of not just SPOT watches, but just about any other digital watch you care to compare it to. The High-T has an amazingly bright backlight. It can literally be read in the dark from across the room. The notches in the top right are where the charger slips in. Even though the contacts are fully exposed, the watch is still water resistant to about 100 feet. A nice and simple watch face. Notice the distinct lack of buttons. 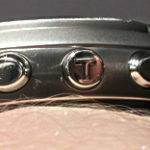 The touch crystal completely replaces the two buttons that you would normally find on the left side of a SPOT watch. 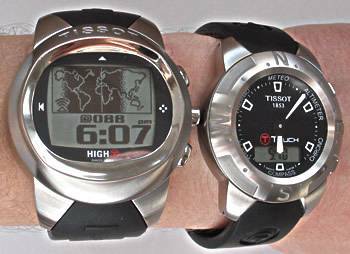 The Tissot High-T next to Tissot T-Touch. They are both excellent watches. Related, but very different. 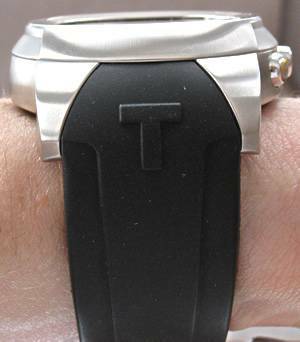 The High-T is not a small watch. 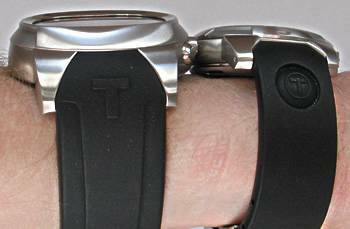 The T-Touch is even taller than most analog watches, and the High-T towers over it. It’s worth the size, though, in my opinion. All those features need a large case. 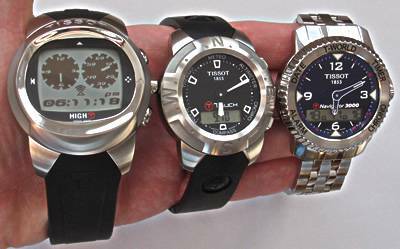 All the Tissot Tactile watches except the Silen-T. From left to right, the High-T, T-Touch, and the brand new Navigator 3000 (review forthcoming). Notice how the bottom half of the face is dark indicating that the total time (in this case, one minute) is half-way expired. 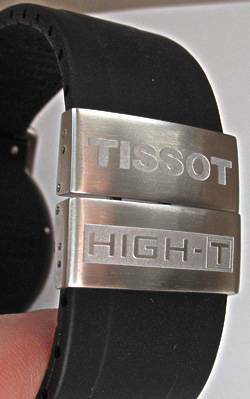 Is there a used TISSOT High-T in a good condition at a reasonable price for sale somewhere ? ? If so, please contact me!